Please respond to the Council’s consultation on their Consultation Portal before 12th Sept 2014. The Council have allocated more sites than needed to meet their target to allow for sites being removed as a result of the consultation. It is therefore important for as many Theale residents as possible to respond to the consultation. Last night West Berkshire Council voted to consult on the allocation of "preferred option" sites for up to 2,088 homes across the district. In the eastern part of the district, that includes Theale, the sites add up to 815 homes. 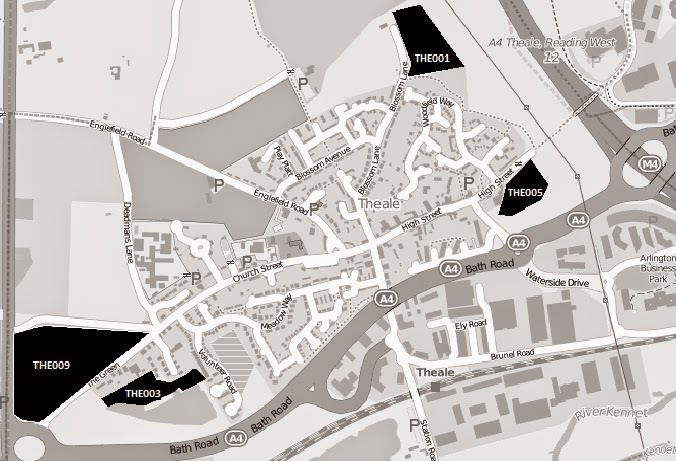 The sites around Theale would accommodate up to 313 homes. Government and Council policies over the years have been aimed at protecting the countryside and restricting development within it. However, we are today being asked to approve the identification of sites for thousands of homes within the countryside, albeit for consultation. Only today it is reported that the CPRE estimates that there is sufficient unused brownfield land across the country to supply seven years worth of housebuilding. It is likely that a similar situation exists here in West Berkshire. There are many empty office blocks throughout the district, including large and modern ones that have never been occupied. I have been told that one large modern business park in the east of the district is 40% vacant. The Government has made it easier to convert offices into housing and this is happening already in Newbury. Yet, no allowance for any further such conversions has been made in the housing targets. The Council's own plans for the London Road Industrial Estate include 300 homes, yet they have not been allowed for in the housing targets. These would account for three-quarters of the proposed housing allocation for the Newbury/Thatcham area. The requirement for housing in the re-development also suggests that there is limited demand for employment land. Many organisations, including this Council, are encouraging employees to work from home and to “hot desk”. This is reducing the demand for office space, as can be seen by the office space now occupied by this Council as compared to a few years ago. This all goes to show that there is not the demand for office space as previously thought and that there is considerable scope for converting or re-developing existing offices for housing. There is also scope for re-allocating land allocated for employment to housing. The Core Strategy says that the role, function and boundaries of the Protected Employment Sites will be reviewed through the Site Allocations and Delivery DPD. However, the required study into employment land requirements was started late and has not yet reported. Therefore, it has not been possible to review these areas to confirm that there could be re-allocation for housing. In conclusion, nowhere near enough has been done to to identify the scope for re-allocating employment land to housing. The Council is therefore being asked to approve the allocation of far more housing in the countryside than is probably required. For this reason, my colleagues and I will be voting against this resolution. Work is expected to start next week on the new skatepark in Theale. It will be located in the recreation ground, between the cricket pitch and the play park. Developers' contributions towards open space improvements. A team of Theale youngsters who originally requested the skatepark will be doing their bit this Saturday, 19th July, starting at 10am. They will be doing a sponsored skate in the car park at Theale Green School. They will be raising funds for things to go round the skatepark, such as benches and litter bins. They aim to skate a combined distance of 50 miles. Please see their flyer and come and support them. I thought that yesterday's exhibition at Burghfield Sailing Club was very poor. There were just a few display boards squeezed into a corner. It was difficult for the public to easily see what was being displayed in the cramped area. I had to speak to one of staff to get my questions answered as the information on the boards was limited. The promised flood alleviation would mainly benefit Sheffield Bottom, with an improved water flow from Hosehill Lake into Theale Lake. The exit weir from Theale Lake (near where the M4 crosses the River Kennet) would be modified to allow the level of the lake to rise up to one meter in times of flooding to accommodate floodwater. The swing bridge would be replaced by a wider and stronger one, though it would still single be track. He said that this was to accommodate buses as they plan a bus service to serve the development form the Theale direction. I would not have thought that a bus service to serve a development of 200 homes would be viable.A replacement bridge with a higher weight limit would, of course, allow trucks to cross it. The 30 "can float" homes would be built on pontoons in docks slightly larger than the pontoon. As water level in the docks increased in times of flood, the pontoons and homes they support would rise with the water level. A central pile would guide the pontoons and homes so that they only rose and fell vertically. A company is proposing to build 200 homes around Theale Lake. This is the lake that the Burghfield Sailing Club uses. It is the large lake you can see on the left as you cross Theale swing bridge on the way to Sheffield Bottom. You can also see it clearly from the M4. Please see this map. You can see more details on the developer's website. The proposal has been covered on BBC South Today news. Please note that this site is not within a "settlement boundary" and is therefore regarded as being in the countryside by West Berkshire Council. As such, it is not regarded as a suitable site for housing under current planning policy. However, this could change over the next couple of years. 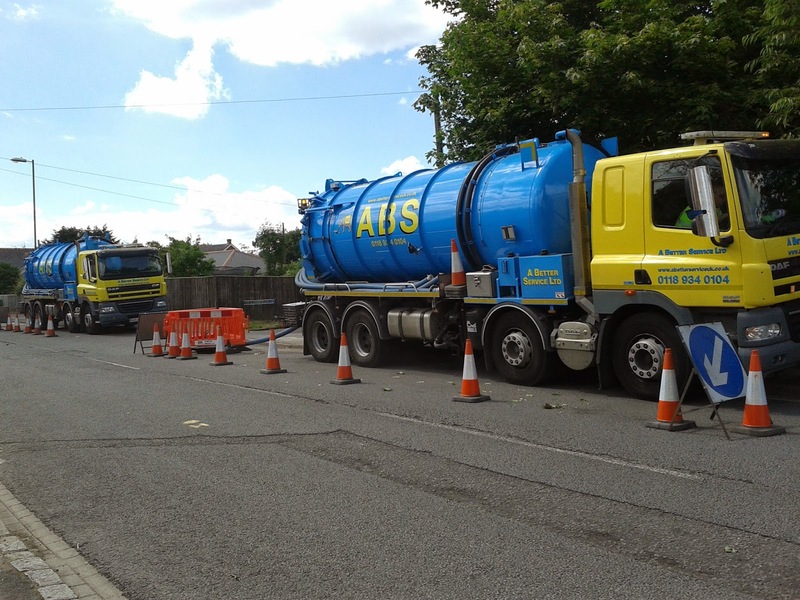 An end to sewage tankering in Church Street, Theale? 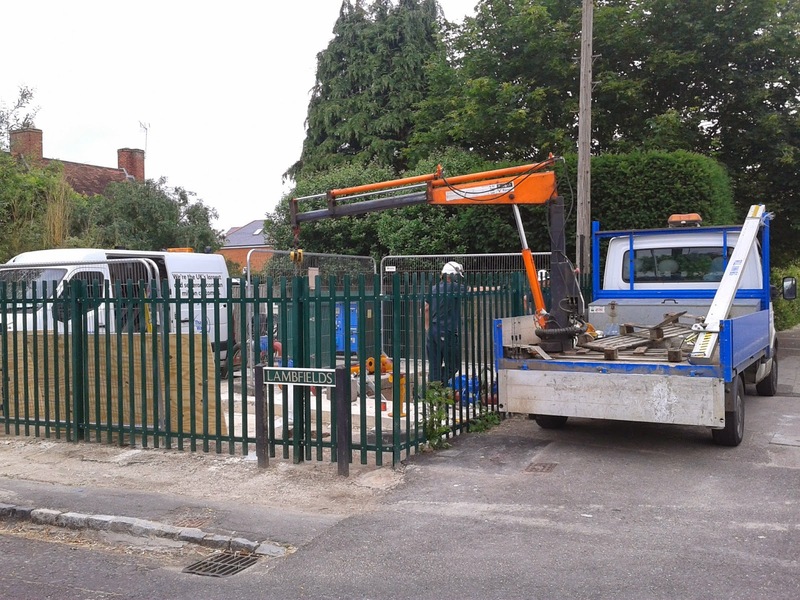 Thames Water promised at the public meeting at the beginning of May that the Lambfields pumping station would be upgraded with new, more powerful, pumps and a new control panel. The work is now almost complete and the new pumps are working. Let's hope that the new pumps can cope with the load and that it will not be necessary to use tankers in this part of Theale, at least.